Some revolutionary multi-touch display technology has been announced, which allows you to work the screen with gloves on. Created by Getac, the new tablet displays have all the functionality of a normal multi-touch, including the ability to move and edit documents, rotate maps and photos, zoom in and zoom out all with a series of gestures, but it can now be done without the need of skin to screen contact. The first batch of tablet PCs to come equipped with the glove-friendly display is the Getac V100, which has a display of 2048x2048 resolution, a 100 points per second report rate, and less than 35ms response time. Speaking about the launch of the new multi-touch display, Peter Molyneux, Business Development Director, Getac UK, said: "Our customers work in some of the most extreme environments and weather conditions where touch screen technology and flick gestures are faster, safer, and more convenient than using a keypad. "As a leading innovator in advanced rugged computer technology, it is only fitting that Getac is the first to offer multi-touch technology that can be used with or without gloves." Personally, TechRadar is just happy that we will be able to use a Tablet PC outside without our delicate fingers getting cold. 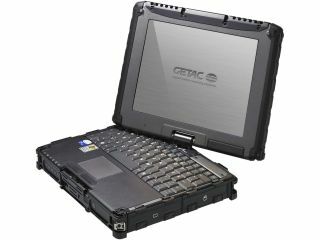 A price and release date of the technology for the rugged Getac V100 has yet to be announced, but as it's Windows 7 compatible expect it to launch around 22 October. Go to www.getac.com for more details.